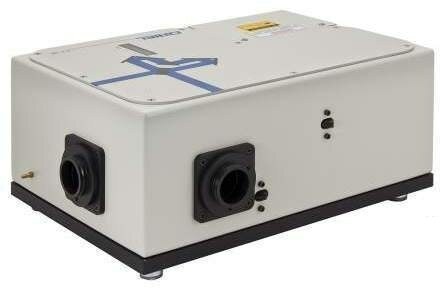 For a flexible, high performance FT-IR at an economical price, Oriel Instruments offers the 80350 model. This scanner is at the heart of the MIR8035™ product family, which is designed for both routine analytical measurements as well as non-traditional applications. The modular design approach ensures the system is easily adaptable to changing needs – simply switch out the components. The 80350 is a Michelson interferometer utilizing a KBr beamsplitter and KBr windows. Mounting its retro-reflector and beam splitter together provides accurate alignment while desensitizing the system to vibrations and temperature fluctuations. This "unibody" approach to the beam splitter makes interchanging components easy, requiring only minimal realignment. The 80350 includes MIRMat™, a sophisticated software package used to configure parameters, acquire and process data. The scanner’s software is customizable with Active X control, allowing users to create their own applications. The instrument comes with a laptop computer with the software pre-installed. To complete the FT-IR system, Oriel offers a wide variety of IR sources, detectors and accessories for use with the 80350 scanner.